It may seem that the topic of React vs Angular has been entirely exhausted. The web is teeming with pertinent articles, reviews, and blog posts. At the same time, nobody has reached a final conclusion and the comparison remains one of the most popular debates among engineers. Sure thing! A headline associated with Google (for Angular) and Facebook (for React) is always a head turner. Railsware cannot stand aside since Railswarians widely deploy both these technologies (one more, another less) as shown in our case studies. Moreover, the company has made its choice. But not all at the same time. Some suggest that comparing Angular vs ReactJS is absurd because the essence of both technologies differs, i.e. it is irrational to place a framework and a library on a par. At the same time, they are front-end user interface designing tools, and our goal is not to talk up one and snub the other. All we want is to show the best sides of both solutions, to make your decision easier. So, let the battle begin. It is a library for building user interfaces. JSX is referred to a syntax sugar to compile into JS. It resembles HTML but is more flexible in use. With it, you can deploy HTML and other components to assemble a non-standardized template. Virtual DOM is one of the key features associated with the library. Unlike other technologies like jQuery, which work with the real DOM, React uses its abstract copy to create a highly dynamic UI. This approach accelerates the work with user interface objects, as well as the implementation of real-time changes. The ability to reuse code components is another advantage of the technology. All components are isolated and any change in one does not cause a chain reaction. Downward data binding means that child elements do not affect parent data. Before we start the comparison, it is necessary to puzzle out what all these numbers mean. I suppose most readers would like to know what is AngularJS and all possible variations of the technology. The story began in 2011 when the almighty Google released its front-end web app framework — AngularJS 1.x. The framework is characterized by two-way data binding, quick prototyping, fast development, dependency injection system, and a huge popularity among software engineers. AngularJS is still highly deployed despite the 2016 release of the Angular 2 rewrite. Since then, the era of Angular without “JS” began. It means that all versions of the technology starting with 2.0.0 are called simply Angular without numeric indexes. Nevertheless, if you need to review Angular vs Angular 2, numbers are essential to differentiate both versions. For now, five versions of the framework are available with the sixth expected to be released pretty soon. In the context of our comparison, we will be using the second and above versions to find out why use React over Angular or vice versa. In short, the complexity inherent to the first version was cut off. Besides, the framework uses a single code for both web and mobile apps. Angular enjoys huge popularity among not only engineers but also famous companies including PayPal, HBO, Nike, Sony, and others. After a small warmup, the contenders are ready for the battle and demonstration of their strength and weaknesses. So, the comparison is on. In most cases, the problem of choice becomes a stumbling point for any endeavor. The same thing refers to selecting a technological solution for a startup. For this reason, we are going to highlight the most topical issues concerning the described technologies. Initially, it is better to realize what development options each technology can offer. Since their nature differs, you cannot use both for a single task. With that in mind, we should examine Angular vs React as a framework vs a library. For example, you are not able to build a web app with the library. React is good to create component-based views. Moreover, you can use a specially developed architectural pattern called Flux to complement the library options. Objective: to provide a great view for apps and offer effective ways to frame reusable declarative plugins. In contrast, the framework stipulates a full component-based structure. Angular is used for building single-page apps. Newer versions expose more options due to the mobile friendliness. Put in short, you can do everything that JS can and many other things in addition. Objective: to provide a complete front-end development solution. Having a plenty of features is not always a good thing. Some developers prefer a minimalistic approach, which is inherent to React. On the contrary, Angular can boast multiple features that are necessary for building an out-of-the-box web app. These include dependency injection, component CSS encapsulation, HTML-based templates, etc. Such peculiarities as a component-based approach, cross-site scripting protection, data binding, utilities for unit-testing components, and platform-independent rendering are associated with both technologies. Angular and React together maintain the concept of components where each component is a UI building unit. However, there are certain differences. Components in React are just JS functions (check out how we made a very simple React component hideable in this blog post), while the Angular’s component hierarchy is sophisticated, i.e. functionality and structure act as an integral whole. This feature is necessary to sync data between the model and view. A unidirectional option involves an automatic view update through any app state modification. A bidirectional option, aka two-way data binding, stipulates the modification of both the view and model due to the integration of properties and events. What do we have with React? It is associated with the one-way data binding where the properties go down from parent to child components. Prior to being converted into the property of the child component, a component state remains inaccessible to other components, i.e. encapsulated. Angular can boast a more advanced approach to data binding since it supports both unidirectional and bidirectional binding, as well as property and event binding. With that in mind, the two-way data flow represents a merge of binding events and properties under one directive. Typescript was created by the Microsoft team on the top of JS. Superset of ES2015 is another definition of the language used for building Angular apps. Its characteristics include a static typing, as well as support for decorators, interfaces, and classes. Another benefit to attract more developers is its learning curve. Those who have a background in .NET and Java won’t face any troubles to master it. We won’t go into particulars of pros and cons. Nevertheless, we can’t but mention static analysis, which is an undisputed merit of the language. It allows the compiler to find mistypes or errors immediately. Facebook’s static type checker called Flow is often compared with TypeScript. Both tools serve the same purpose but work differently. Flow is “closer” to JS as it’s based on comparing subset of object properties, while TypeScript is more strict and requires not only shape but exact type. The mentioned technologies do not exist on their own. Multiple libraries, frameworks, and miscellaneous tools are created to enhance each solution’s ecosystem. Moreover, the usefulness of such tooling sometimes can excel the functionality of the very technology. Let’s see what we’ve got. The availability of a CLI tool to avoid fussing around configuration is a trend among modern frameworks. Each technology can boast such innovation to assist a project bootstrap. A couple of commands within Angular CLI allow you to set up a project without any concerns. With this tool, you can start a development server, create a bundle, run test, etc. The same options are available for React users with Create React App. This utility supports back-end proxies for local development, Flow (will be mentioned below), flexible application profiling and other features to set up new projects quickly. This name already emerged in this Angular vs React battle review. The idea of this JS library is to manage state modifications. At this time, a single object represents the entire application state. Reducers (functions) are used to reshape the state for better separation of concerns and testability, i.e. to achieve a clear structure. It should be mentioned that small project might not benefit from Redux. However, large-scale projects will appreciate the library. By the way, some Angular-based projects opt for Redux as well. This library is an alternative to the previously mentioned one. It does not encourage keeping the state permanent but storing the minimal required state. Reactive logic is introduced through a set of decorators. This is the name of a reactive programming library. RxJS is a package of functions designed to handle asynchronous event and operations in a more flexible way. Such operations as merging/splitting, filtering, and mapping are also available due to this tool. However, a fly in the ointment is a regular thing. The extreme power of RxJS entails its complexity to master. Work with websockets and other types of continuous data streams will benefit from using RxJS. Nevertheless, Angular engineers should have at least basic background of the library. The library can be used with React and any other library or framework including Angular. Redux played a role in inspiring the creation of this state management library for Angular. If you integrate @ngrx/store with the aforementioned reactive programming library, you will be able to improve performance through the OnPush Change Detection strategy. How do you think, is it possible to build a mobile app with Angular? It is, if you opt for a tool called Ionic. With this open-source framework, which is based on HTML5, you are able to create cross-platform mobile apps. Facebook does not lag behind Google and strives to conquer the market of mobile apps with its framework called React Native. It underlies the mobile apps of Skype, Instagram, Tesla, and many others. 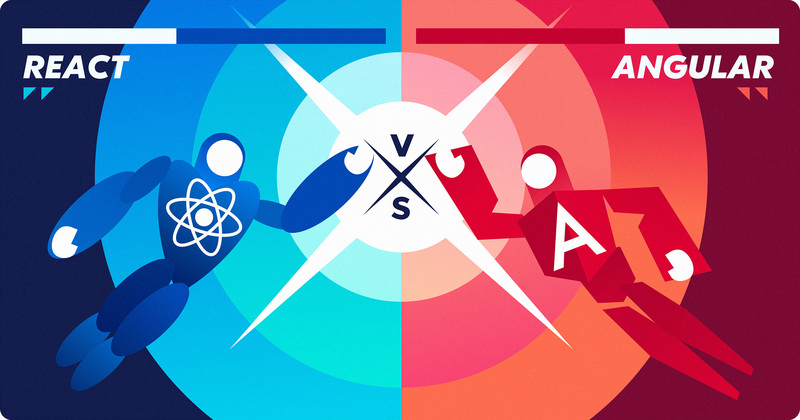 Besides, we’ve made a comparison of Ionic vs. React Native to show you the pros and cons of each technological solution. We have already described the options to set up the server-side rendering of React apps. At the same time, the most flexible way to perform this is to opt for Next.js. The framework is designed to simplify the process as much as possible with minimal structure requirements of your project. The following things are unlikely to answer the question “Why React is better than Angular?” but are also essential to shaping a general understanding of the library. Since Facebook takes care about its engineers, this type-checking tool for JS was developed. Flow enables code checking for common type errors. It should seem that the above said Typescript is able to do the same sort of thing. However, with Flow, you do not have to migrate to a new language and make type-checking annotations. The tools is a fit for static code analysis without a necessity to rewrite the existing code. React has another interesting tool in store. Storybook is the name of a component development environment. With it, you can set up a separate app to demonstrate components. In addition, a number of functional add-ons are available. Both engineers and designers may find the tool useful for the independent development of components. React is a more flexible solution but learning the best practices is what you should expect initially. However, JSX is the major point to master at first. Devil is not as black as he is painted because loops and logical structures are the same that in JS. However, you are likely to sweat over an HTML-like syntax. Another tricky part is delving into additional libraries and tools. Nevertheless, if we had to choose between Angular vs React subject to the simplicity to start, the latter one would be an undisputed winner. Even a limited experience in front-end development won’t be a blockage to your way of mastering the tool. Here you can find our picks of books to learn both React and React Native. And now let’s sum up what we like and dislike in both technologies. In this React and Angular comparison, there are descriptions of many things disclosing versatile peculiarities of both technologies. They differ in many things including main purpose, functionality, change detection approach, languages used, data binding, document object module, etc. At the same time, both platforms are front-end technologies that are created to function with functional reactive and object-oriented programming paradigms. Railsware has not refused from one in favor of another. However, projects built with Angular are rarer in the company than those with React are. In fact, you may encounter numerous switch-to-React cases on the web, as well as React-to-Vue.js ones. Each of them has own reasons for such decision. Still, it would be wrong to claim that the Google’s framework is on its last legs. Be attentive and well-targeted in making your choice. Good luck! Python vs. Ruby vs. Node.js – Which platform is a fit for your project? Railsware is a leading Ruby on Rails company which provides contracting and consulting services around the world. We are among the premium ruby on rails companies on the US market and our ROR development company is the exeperts at Ruby, Rails, HTML 5, and CSS3.